Selected to represent the six cars 70—75 of the Rochester & Sodus Bay Railway, car 70 is seen in this builder’s photo in the Jackson and Sharp factory’s yard in Wilmington, Delaware. Company records indicate that these six cars were built under shop orders 1681—1686, placed November 21, 1899. We can be fairly certain this car is shown at Jackson and Sharp since the car rides on shop trucks, and car equipment (such as trolley poles) has yet to be added to the car. Since the cars were delivered in April 1900, our photo was probably made in March 1900. All told, some 16 R&SB cars (straight coaches 70—75, and combination cars 50—55 and 90—93) would be shipped north in April 1900. Once equipped and in service, the R&SB cars, all the same overall dimensions as car 70, would have dwarfed the diminutive single-truck city cars then performing nearly all city streetcar work in Rochester. 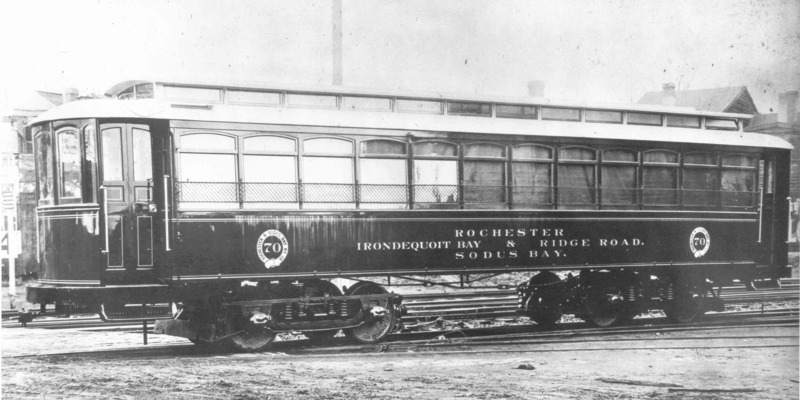 As history would have it, the R&SB cars were the first interurban cars and among the first double-truck cars to operate in Rochester. These cars were not originally equipped with air brakes. Instead, the cars were equipped with an electric brake. By use of the controller handle, it was possible to turn the traction motors into generators which then fed power to the resistor grids. This resistance would slow the car to the point that the hand brakes could effectively be used for the final stop of the car. By about 1902, however, the cars received air brakes. Sometime between about 1906 and 1909, the R&SB cars lost their original paint scheme in favor of New York Central coach green, and were renumbered. One of the 70—75 cars had been lost by this time, and the straight coaches were renumbered 110—114. These straight coaches proved just right for the R&SB run’s steep grades at Irondequoit Bay and its mile after mile of side-of-road running along Ridge Road. So successful were these cars that all lasted to the last day of R&SB operation on June 27, 1929. By 1933 or so, though, all the former 70-series cars were gone from the property and had either been scrapped or (as in the case of cars 110—113) become small sheds or farm buildings. There may be a coda of sorts to the story. No records were kept of the new numbers that the 70-series cars received when renumbered into the 110-series. Car 113 now resides in storage at Seashore Trolley Museum, near Kennebunkport, Maine as the oldest extant American interurban car. Could it be that 113 was originally car 70? We will never know for sure, unless an old car number turns up after having been buried for over a century under layers of paint. What we can be sure of, though, is that the 70-series group of cars is far from extinct.